Last night’s trick or treating was so much fun! We left work early to take the kids out and it was still pouring rain all the way home, but when we got to MIL’s house, the rain was just drizzling here and there. We ate dinner and got the kiddos dressed. Buddy was very resistant, protesting the entire time I took off his clothes and then finally took off running in just his diaper and I had to chase him around for a bit. He had some serious issues with wearing his costume and kept crying, “Nooooo! Nooooo!” whenever I tried to put it on until finally I said, “You want puffs? ?” (those star shaped Gerber things) and his eyes glazed over and he said, “Puff.” He let me put it on no problem! Yay, problem solved right? 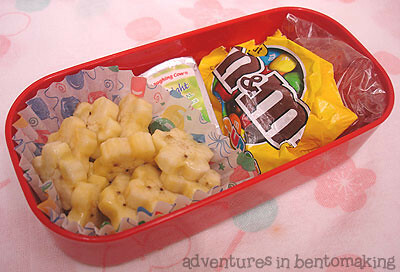 I had nothing but fruits and vegetables to put into a bento today, so that’s what I ended up with. I’ve got a bunch of cucumber slices, which I will sprinkle with salt before I eat, then three colors of bell peppers with some fat free Ranch dressing in the little cup. It’s oh so healthy, no?? Hahaha!! Second layer: NOT! I’ve got some Halloween munching to do and so I picked out one of my favorites, peanut M&Ms! I figure this is a much better portion than if I were to go buy a regular sized bag from the vending machine. I’ve also got this lil packet of sour apples and then some sakura shaped banana slices. There’s also a little hidden Laughing Cow Light Swiss wedge in there. Today is November 1st, I leave for Fan Fest in less than two weeks! Ahhhhh!! Panic panic panic!!! Last night I had a whole lot of stuff to do and so when I laid down with the kiddos to put them to sleep, I told Mr. Pikko that I *had* to get up again to work on that stuff, so he *had* to wake me up. I distinctly remember him eventually resorting to kicking me and I never did wake up, so I must have been dead tired. It all worked out though as when I woke up to set my alarm, I set it for 4:00 am, but I ended up waking up earlier than that anyway. This actually turned out really well for me and I think I may end up doing that whenever I fall asleep early. It gives me a ton of time to work on things. I suspect my daughter has a little child crush on a boy in her class. She’s been telling us that her favorite boy at school is Ryan. One day when we picked her up, the two of them were sitting together on the floor outside their classroom. Yesterday on the way to school she told us that “Ryan is going to be Thomas the Train for Halloween.” I asked her if she told him what she was going to be and she said, “No…” so I asked if she talks to him at all and she said, “Not yet.” lol! They sat together at the Halloween program. lolol! 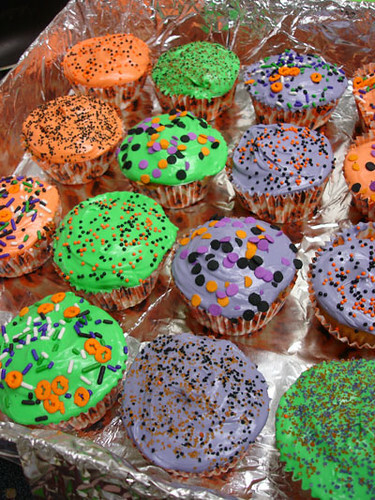 This morning when I showed her the cupcakes, the first thing she blurted out was, “Can I give one to Ryan?” lololol! It cracks me up!! She sits next to a different boy in class and one day when she went into the room, I saw him pull out her chair for her to sit down. I thought it was so adorable so I asked her about it and she goes, “He shouldn’t have touched it, that’s MY chair!” O. M. G. Women’s lib starting in preschool, hahaha!! 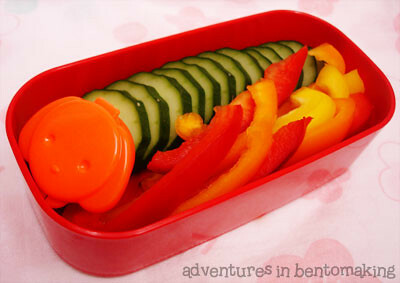 Ok anyway, my bento. 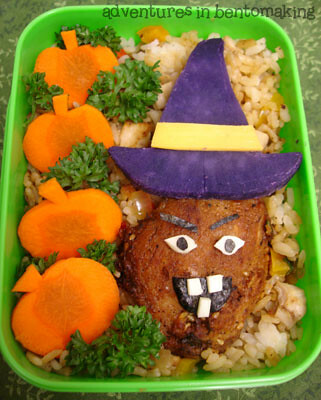 I still had a lot of fried rice left, so I used it as “dirt” for a carrot pumpkin patch and also as a bed for my witch. I had intended to chop the chicken up into bite size pieces for easy eating but then when I nuked it and took it out, it looked like a face, so I sliced off the excess and used it as a witch face. The hat is made out of baked Okinawan sweet potato and a slice of cheese makes the ribbon on it. The eyes and mouth are made out of swiss cheese and nori. I couldn’t figure out how to make her a nose, so let’s just say she looks pissed because someone stole it or something. It was pouring this morning. How lame is that? Raining in Hawaii on Halloween. Boo!